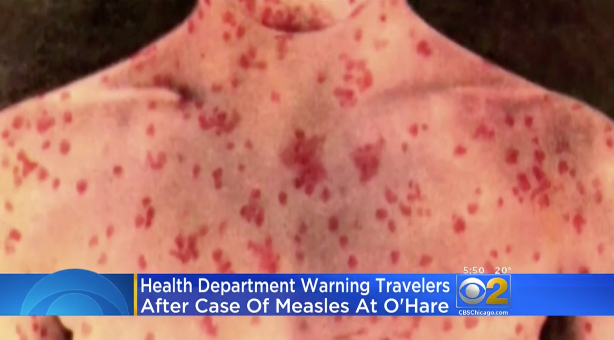 CHICAGO — A passenger on an international flight with a confirmed case of measles arrived at O'Hare International Airport, potentially exposing others at the airport to the highly contagious disease, CBS Chicago reports. According to the Illinois Department of Public Health (IDPH), the passenger, who was infectious at the time, arrived last Wednesday on an international flight at Terminal 5 and departed on a domestic flight from Terminal 1. People may have been exposed if they were at O'Hare between 6:30 a.m. and 1:00 p.m. on Wednesday, Jan. 10. The IDPH says those who have not been vaccinated are of most concern. "Measles is a very contagious virus, and it can hang around in the air for up to an hour or two after a person has left," said the University of Chicago Medicine's Dr. Allison Bartlett. "Certainly the people who were on the plane with this individual are at risk of getting the infection, but so are the other people who may have shared the same space with this person during this six-hour period that they were at O'Hare." If infected, symptoms could develop as late as the end of the month. Rash, high fever, cough, runny nose and red watery eyes are some of the symptoms associated with measles. In rare cases, complications can be life-threatening. "Two doses of measles vaccine are about 97 percent effective in preventing measles," said IDPH Chief Medical Officer Dr. Jennifer Layden. "We urge everyone to make sure they and their family members are up-to-date on measles, mumps, rubella vaccine and all other age-appropriate immunizations. Getting vaccinated not only protects you, it protects others around you who are too young to get the vaccine or can't receive it for medical reasons." Individuals who think they have been exposed should check with their health care provider about whether they're protected through a prior vaccination or about the need for vaccination. Local health departments are working to notify Illinois residents who were identified as being potentially exposed on the ill person's flights.